All the awards Olympus has won? Thread: All the awards Olympus has won? I would like to form a list of all the lenses/bodies over the last few years that Olympus has won. Then we can put the thread in 1 place. Does anyone have them booked marked? Re: All the awards Olympus has won? Melville, New York, November 10, 2003 - The Olympus E-1 Digital SLR, introduced to the market only last month, is already winning major awards for its innovative design and superior performance. Yesterday, the Olympus E-1 won Popular Science magazine's Best of What's New Award in the photography category. Last week, Professional Photographer presented the E-1 with its 2003 Hot1 Award for Professional Digital SLR Under $3,000 and Electronic Publishing honored the E-1 with its 11th annual Hot Product award. And early next year, the PhotoImaging Manufacturers and Distributors Association (PMDA) will bestow its prestigious Technical Achievement Award for 2004 on Mr. Yasuo Asakura of Olympus, who designed the E-1. CENTER VALLEY, Pa, November 7, 2006 - Olympus Imaging America Inc. is proud to announce that the Olympus EVOLT E-330, the world's first interchangeable lens digital SLR (single lens reflex) to feature a true "Live View" image on the LCD screen, in addition to the optical viewfinder, has won a 2006 Popular Science Best of What's New Award in the Gadgets category. I'm nobody's fool. I can do it all on my own. I would like to form a list of all the lenses over the last few years that Olympus has won. Unfortunately I don't have anything as useful as that but interested to see such a list. Think it goes in this category. Highest honours from DIWA also go to the Top Pro ZUIKO DIGITAL ED 150mm 1:2.0 lens. DIWA members tested the bright, high-end lens relentlessly and determined that: "The outstanding ZUIKO DIGITAL 150mm 1:2.0 is the best lens ever tested at DIWA Labs, showing modest quality reduction with the EC-14 tele converter added. A top performing 300mm 1:2.0 or 420mm 1:2.8 (35mm equivalents) in such a light weight and compact design is truly remarkable". 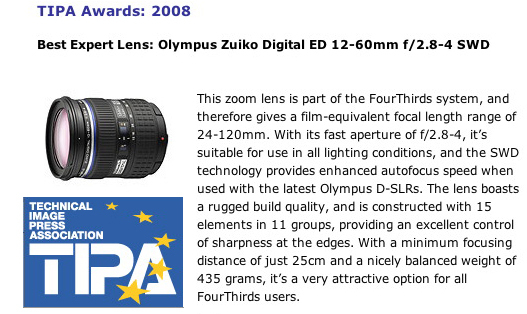 Top accolades for the professional camera in the Olympus E-System. The E-3 has received a Gold Award in Amsterdam from the Digital Imaging Websites Association (DIWA). An association of independent web-based specialist publications from around the world, DIWA bestowed the E-3 with the prestigious Gold Award due to its superb technological advances and high performance attributes. Top handling, extremely high image quality and compatibility with the compact, high performance ZUIKO DIGITAL lenses have all been proven in numerous tests by DIWA members. With the current E-3 as the flagship model, DIWA contends that Olympus is on the right track to firmly establish the Four Thirds System in the D-SLR market. i found E-3 european awards list yesterday here: http://www.olympus.cz/consumer/dslr_...E-3_Awards.htm but some are unreadable to me (and i don't know all that logos).